It’s time to hit the slopes! Winter is finally approaching and today we had the first official snow fall.. so start planning your ski trips! Whether you want to plan a trip with 10 of your closest friends, or head to a mountain for a quick day trip, you have to get to at least one of these mountains below. Convenient for those living in the Boston and Worcester area, Wachusett Mountain is perfect for a day trip. The mountain has 25 trails with 8 different ski lifts. This mountain also offers night skiing! After a few runs, cozy up with a glass of vino or spiked hot chocolate inside the Coppertop Lounge and then head back out for a chocolate covered waffle at the waffle house. Another close destination to Boston and Worcester residents, this mountain is great for a day trip. With 17 trails, tubing, activities and lessons, this resort is a must this winter. Also, make sure you have time for a delicious meal and some wine at the Outlook at the resort on site – yum! With several hotels and lodging, restaurants, shops and bars, this resort is perfect for a romantic weekend getaway with your significant other or fun trip family and friends. 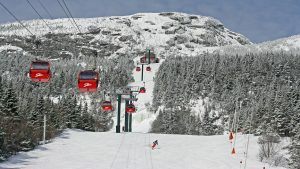 The resort is celebrating their 50th anniversary, and is offering several winter activities other than skiing/snowboarding, like dog sled excursions, horse and sleigh rides, and ice skating. 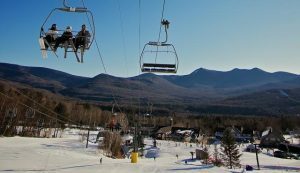 Located in the White Mountains, the surrounding area around the mountain is full of restaurants and other entertainment. This resort is perfect for the friend who isn’t really into skiing, but still wants to come along for the trip. 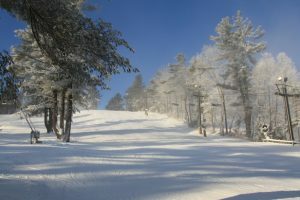 The mountain offers snow-shoeing and cross country tours, zip lining, and ice skating. With 2 parks and over 61 trails, this mountain will keep you exploring all weekend! Vermont is THE place to go skiing. 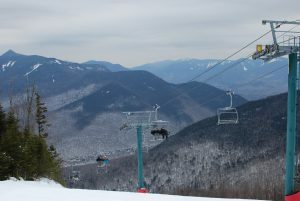 Stowe Mountain was ranked #1 in the Northeast by SKI Magazine. With 116 trails, this mountain is a must-do for any ski lover. A great place to bring the family, the resort offers many kids programs including a day care. This resort is great to take an extended weekend or even a full week. Take an extra day to relax in their spa! Perfect for a family vacation over winter break. You will never be bored at this resorhttps://www.stowe.com/t – and you wont have to worry about keeping the kids occupied! The resort has 78 trails, an ice skating rink, a brewery and an INDOOR WATER PARK. The resort also offers fun events almost daily, such as a ‘Paint and Pour’ night and Trivia Night. My personal favorite part of the ski day, is the glass of wine you can reward yourself with after a run. Warm up with some Wicked Merlot after. Be safe and have a great time! This entry was posted in Events and tagged jaypeak, loonmountain, massachusetts, mountain, nashobavalley, newhampshire, ski, snow, snowboard, stowe, vermont, wachusettmountain, watervillevalley, winter, winteractivities. Bookmark the permalink. ← Wine of the Month – Malbec!